Don’t kid yourself – you’ve got an ego and sometimes it gets out of control. You may not act like a pompous jerk in public, but if you’re human (and if you’re reading this then there’s a good chance you are), you’ve undoubtedly had those self-righteous, egotistical thoughts run through your mind from time to time whenever you’ve felt the need to impress someone or in response to a perceived slight. If you’re not careful to keep your ego in check, it’s likely that it’s causing you to erode trust in your relationships. One of the four key elements of establishing trust in a relationship is being “believable,” which means acting with integrity. In polls and surveys I’ve conducted with hundreds of people, this one element is often cited as the most important element in building trust. 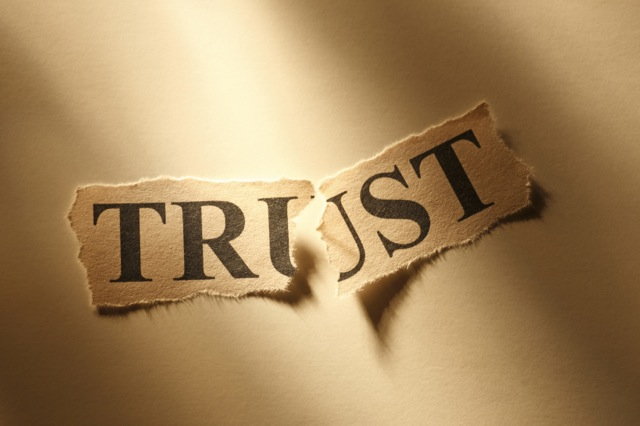 It’s also the element of trust that takes the biggest hit if your ego is left unchecked. An out of control ego signals to other people that you believe you’re more important than them, place your interests ahead of theirs, and that others can’t be vulnerable with you without fear of being taken advantage of. There are three key areas leaders can focus on to keep their ego in check, increase their “believability” with others, and build trust. Honesty — The basics apply here: don’t lie, cheat, or steal. But being honest also means not stretching the truth, telling half-truths, omitting facts out of convenience, or failing to speak the truth when needed. Values — Do you know what your core values are? What motivates you as a leader? When faced with a difficult choice, what are the values you use to filter your decision? Developing and articulating your values, and asking others to hold you accountable to living out those behaviors, will help keep your ego in check and allow others to gain confidence in the consistency of your behavior. Fair Process — Do you treat people fairly? Egotistical leaders love to play favorites. Trustworthy leaders treat people ethically and equitably. Being fair doesn’t mean treating people the same across the board, no matter the circumstances. It means treating people fairly according to their specific situation and upholding consistent principles and ideals with your entire staff. A believable leader is someone who acts with integrity and is a role model for the company’s values. We commonly describe believable leaders as credible, honest, and ethical. When someone is believable, he or she tells the truth, holds confidences, is honest about his or her skills, and gives credit when credit is due. Notice that egotistical doesn’t appear anywhere in that description. Egotistical leaders “bust” trust, whereas as believable leaders “boost” trust, and by focusing on developing honesty, values alignment, and acting fairly, leaders can keep their ego in check and build trust in the process. I originally published this article in June 2012 under a different title for the LeaderChat.org blog and decided to share it here with the LeadingWithTrust community. ← Are You Suffering From The Illusion of Transparency?